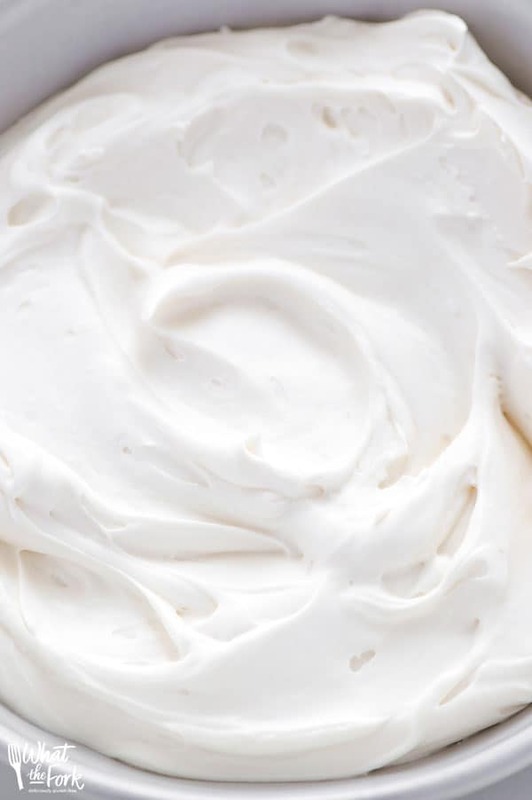 Sweet and creamy two-ingredient white chocolate ganache whipped cream is perfect for any recipe where you’d use whipped cream. It also makes a wonderfully light and airy frosting for cakes and cupcakes. I’ve always loved whipped cream based frosting on cakes. I love how light and airy it is. 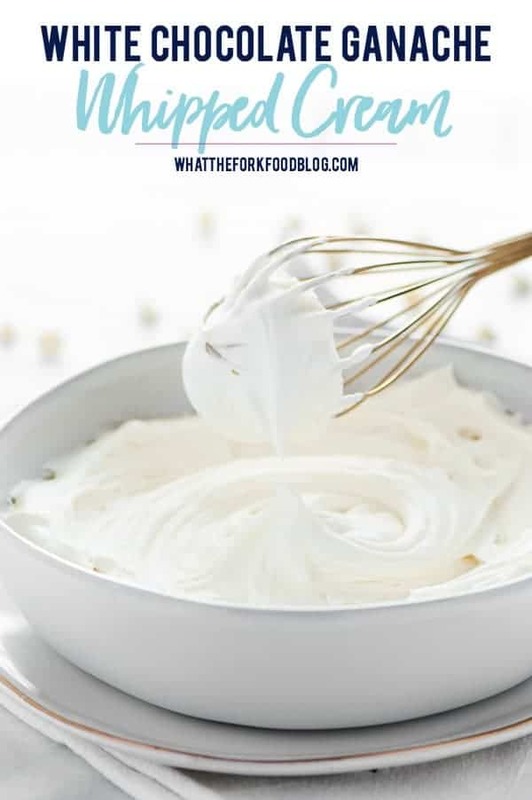 I know not everyone loves whipped cream frosting but this two ingredient white chocolate ganache whipped cream will surely change your mind! Yes, TWO INGREDIENTS. TWO! I love easy recipes that call for just a few things and turn into something fabulous. This recipe does just that. Making white chocolate ganache sounds daunting. But don’t run away because it’s super easy! It involves heating cream and white chocolate chips together until the chocolate is melted and the mixture is smooth then chilling it. Yep, two ingredients, two steps. So.Easy. Even my husband could make this with no problem. 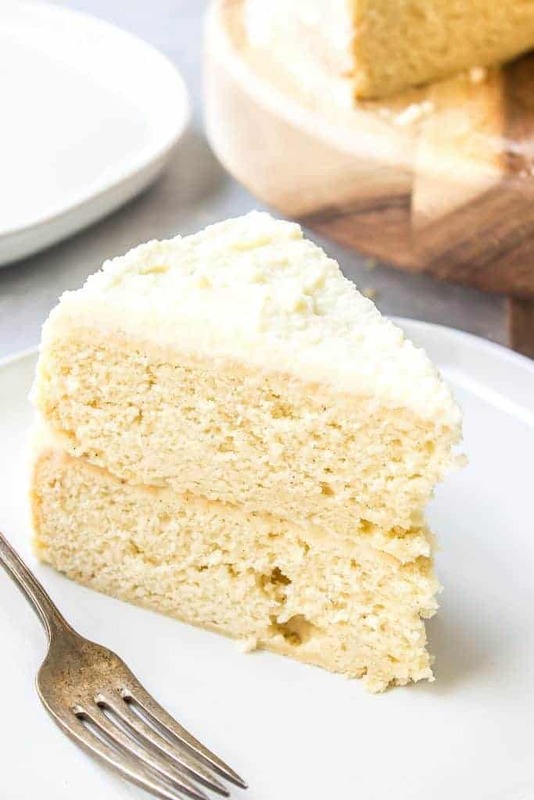 The white chocolate ganache gives the whipped cream enough body so that it’s thick and sturdy enough to use as a frosting on a standard layer cake. As a cake frosting, it will stay put on a cake for days if refrigerated. 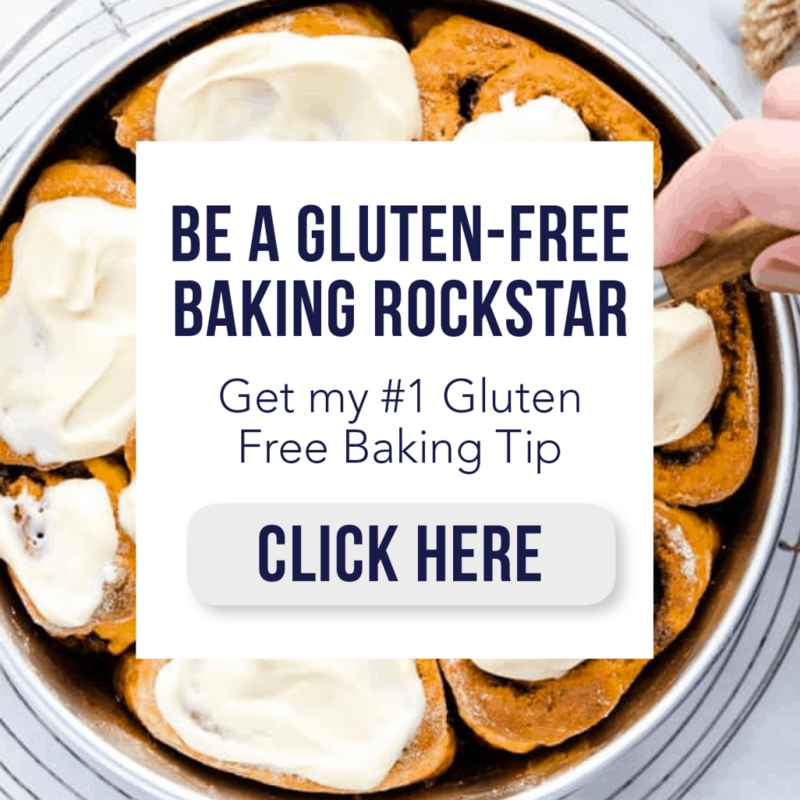 I used this white chocolate ganache whipped cream to frost my gluten free eggnog cake, which makes a fabulous holiday dessert! It would also be great on top of my Individual No-Bake Salted Caramel Cheesecakes. Enjoy! **November 30, 2015 UPDATE – I have updated the recipe with specific recommendations for the white chocolate in this recipe. Make sure you are working with NEW white chocolate. Using old white chocolate can result in this recipe not working. 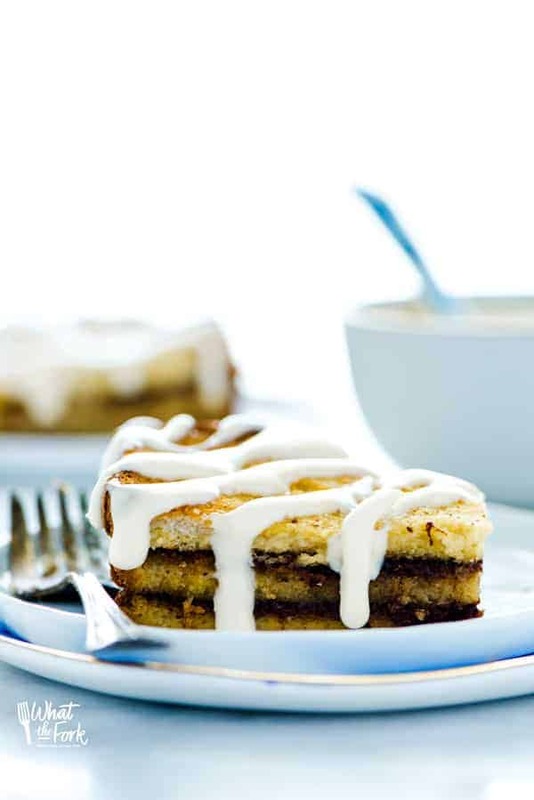 Using Nestle brand white chocolate chips will also result in this recipe not working correctly. 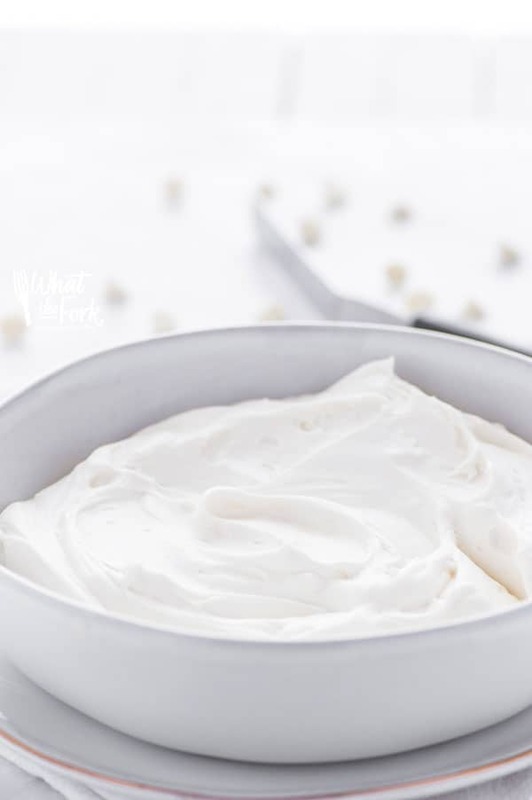 Sweet and creamy two ingredient white chocolate ganache whipped cream is perfect for any recipe where you’d use whipped cream. It also makes a wonderfully light and airy frosting for cakes and cupcakes. For the White Chocolate Ganache: Heat 1/2 C cream and the white chocolate chips in the microwave at 50% power for 45 seconds. Stir well and then heat at 50% power for 20 second intervals until the chocolate is completely melted, stirring each time. There shouldn't be ANY lumps in your white chocolate. Cool to room temperature then refrigerate overnight. 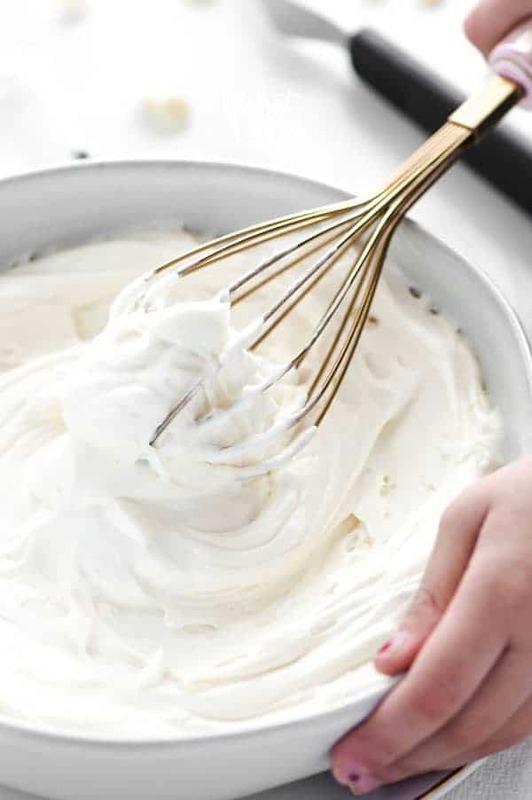 Once the white chocolate ganache is chilled (it will be soft and not solid like regular chocolate ganache), use the whisk attachment and whip with an electric mixer on low speed and gradually working up to high speed until the ganache is light and fluffy, about 1 minute. 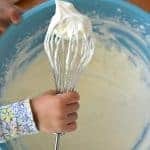 Pour the remaining 1/2 cup of whipping cream then whip on low speed working your way up to medium-high speed until soft peaks form and the whip cream holds it's shape on the whisk, about 1 minute (more or less depending on the speed and power of your mixer). Serve with any recipe calling for whipped cream or pipe/spread on cupcakes or a standard size cake. 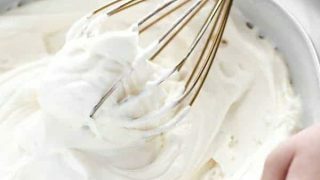 The white chocolate ganache whipped cream frosting will stay stable in the refrigerator for up to 1 week. Due to the nature of working with white chocolate, use BRAND NEW white chocolate chips. Using old ones can result in this recipe not working correctly as the white chocolate will not melt properly. Use a HIGH-QUALITY WHITE CHOCOLATE that melts well. DO NOT use Nestle. Nestle will not melt correctly and you will most likely overheat the chocolate before it is melted enough which will result in this recipe not working. I make my ganache in a large, glass Pyrex bowl. 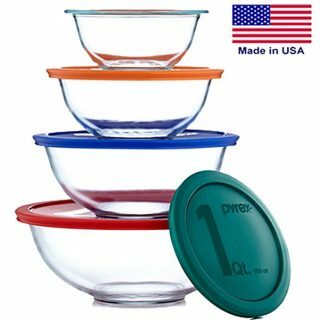 It's microwave safe and can go in the refrigerator. I then whip the cream right in that same bowl. I use a to make the whipped cream. 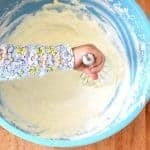 Use the WHISK attachment - not the beaters for your electric mixer. Keep refrigerated until ready to serve. Refrigerate leftovers. It will last in the refrigerator up to one week. Here I am, pinning away on a snowy afternoon and then I come across this! I stopped right away and headed over. Why have I never thought to combine white chocolate with cream? I wish I could just reach through the screen and snag a dollop of this! Can’t wait to try this! 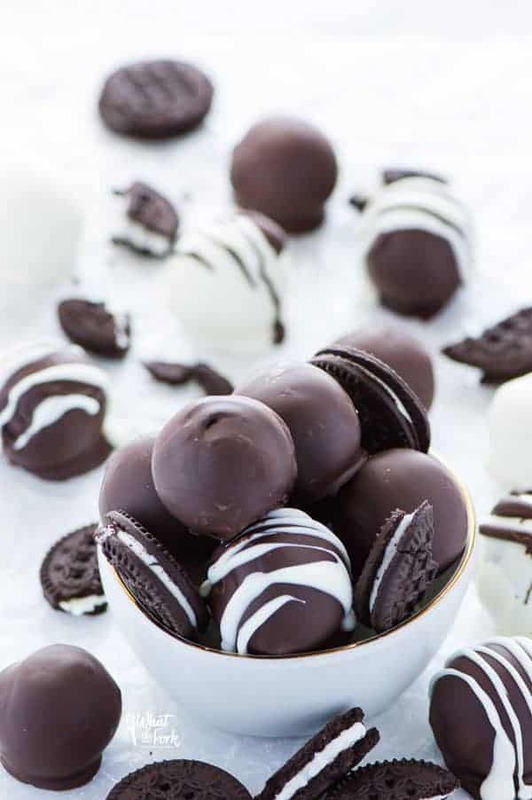 Mmm my mom would love this (she’s obsessed with white chocolate), I will have to pin it and make it for her as a surprise with some cake 😉 PS. Your little hand model is ADORABLE! Thanks so much, she LOVES getting to help! Mmmm white chocolate!! My favorite 🙂 I am going to try and make it from scratch actually! Wow, white chocolate from scratch!? So impressive! Your little girl’s hand is adorable! My 2 year old granddaughter is totally into helping to mix everything now. I can’t wait to try this frosting! Thank you! Thanks for sharing it Cindy! Thanks Judee, it is pretty easy as far as icings go! Love that it’s so simple. I need simple during the holiday season 🙂 Thanks for sharing this on Merry Monday. Will this stay firm if piped on to cupcakes so it looks like little flowers or will it soften? I haven’t used this for cupcakes but I’ve used it to frost layer cakes and it holds up fine. thanks Sharon, sounds like heaven! I’ve always liked whipped cream frosting on cakes too. A white chocolate version sounds amazing and so easy!! Pinning, and definitely making this one!! Do you know to make this non dairy? Would canned coconut milk work? 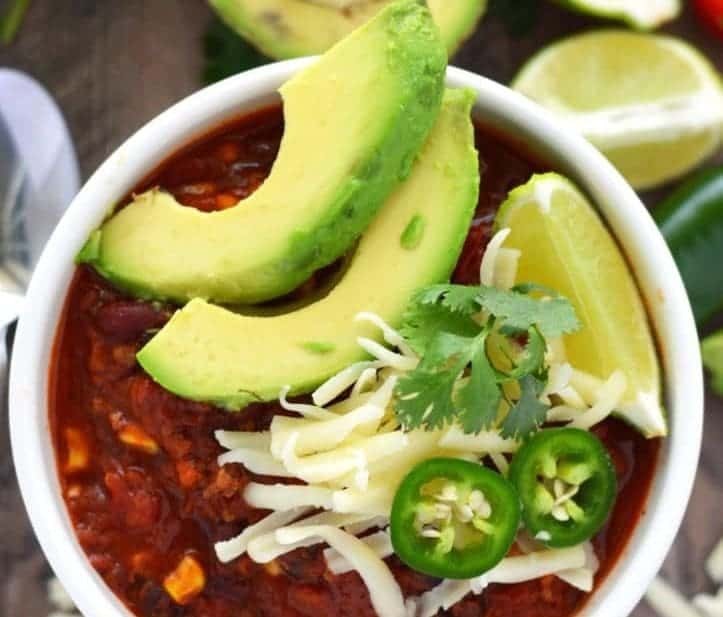 I’ve never tried making this with dairy free subs since it’s not intended to be a dairy free recipe. I have a question. If i have 12oz bag of Hersheys White chcolate chips, How much Heavy cream should I use.???. Looks delicious !! I love Chocolate with cream so much. I want to try out this today and seems to be easier to make it. Anyway, the pictures are really incredible. i made this and it broke down and separated on me. Don,t now if I blended it too long? Any suggestions on what I did wrong ? Sorry it didn’t work out for you! 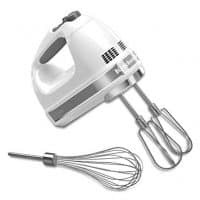 You may have whipped it too long, it may not take the full 3 minutes since it depends on the speed/power of your mixer. Also be sure the ganache is COLD before whipping. The ganache needs to be as cold as the heavy cream for whipping. I must be doing something wrong. I followed the recipe exactly including the Hershey’s chips and it never whipped up like cream. I’ve actually tried this twice now and the first time I got very sweet butter! I need to get this work for a dinner I’m making 200 cream puffs for 🙂 The second time I tried this I beat it in my Kitchenaid for over 10 minutes. It did thicken up in the refrigerator but not to the point that I can use it to fill cream puffs. I can do regular chocolate no problem but for some reason the white chocolate isn’t coming out. Thanks for contacting me. I’ve gotten a few emails from people who tried this recipe unsuccessfully. I’m going to be working with this recipe again to try and pin point where the problems might be. I’ll let you know what I come up with – so sorry it’s not working for you right now! Does using double cream have the same effect? I guess I’ll have to wait and see on this one haha! thanks for sharing, Sharon! I haven’t tried it with double cream. Sorry! Professional Pastry Chef here. I think a lot of you are having a problem because you’re trying to whip the ganache when it is TOO COLD. In it’s cold state, ganache’s instinct is to break down, because of the cocoa butter in chocolate. Cocoa butter does not like the cold. Try leaving the ganache on the counter for a little bit, so that it gets more towards room temperature when you whip it. Crazy thing is, I’ve been making a version of this for years. BUT WITHOUT WHIPPING IT. Duh. NOW it is absolutely, unbelievable exquisite! Love love LOVE! My daughter wants it on her birthday cake (party tomorrow). Made my wife a a birthday cheesecake and the recipe called for a white chocolate ganache. At first I was intimidated by the word ganache but I found your recipe and was so excited when I found your websit! Thank you so much this ganache made the cheesecake form good to greate! Thanks for the feedback Joe! I’ll have to try this on cheesecake now! If I used this as a frosting on a cake,would the cake then need to be kept refrigerated what with it being cream or is it stable enough at room temperature (in the uk) with the chocolate in it? I use this for my Eggnog Cake (a layer cake). The white chocolate stabilizes it so gelatin isn’t needed. what brand of white chocolate do you recommend? For gluten free, use Guittard. If you’re not gluten free, you can use Ghirardelli. I find that Nestle can melt very inconsistently.